Find out what the hype is all about! Fox Searchlight has dropped the first trailer for the film Patti Cake$, one of the most buzzed films from Sundance this year, where it premiered to standing ovations. Patti Cake$ features the big screen debut of Australian native Danielle Macdonald, playing the role of aspiring rapper Patricia Dombrowski, aka "Killa P", aka "Patti Cake$", from New Jersey. The story follows her struggles as she tries to make a name for herself in a town that doesn't care much about anyone. The cast includes Cathy Moriarty, Siddharth Dhananjay, Mamoudou Athie, and Bridget Everett. This wasn't exactly one of my favorite films of Sundance (read my review) but it has a lot of heart, it's raucus and entertaining, and it tells an encouraging story of ignoring what others say, and becoming who you really are deep down. Dig it. Patti Cake$ introduces Danielle Macdonald in a breakout role, as aspiring rapper Patricia Dombrowski, a.k.a. Killa P, a.k.a. Patti Cake$. Fighting an unlikely quest for glory in her downtrodden hometown in Jersey where her life is falling apart, Patti tries to reach the big time in the hip hop scene with original and affecting music. Cheered on by her grandmother (Cathy Moriarty) and only friends, Jheri (Siddharth Dhananjay) and Basterd (Mamoudou Athie), Patti also shoulders her mom's (Bridget Everett) heartaches and misfortunes. Patti Cake$ is written & directed by filmmaker Geremy Jasper, making his feature directorial debut after a few shorts. This premiered at the Sundance Film Festival this year. 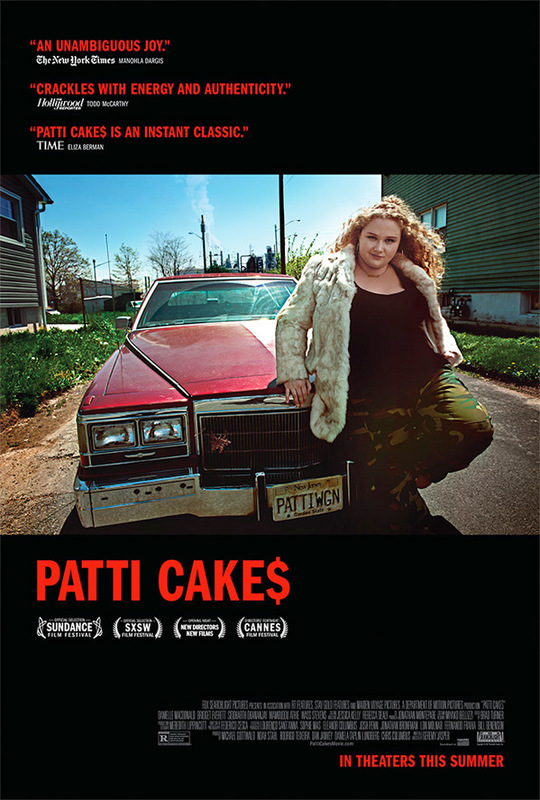 Fox Searchlight will release Patti Cake$ in select theaters starting on August 18th later this summer. Who's down for this?